"Where Everyone Can Become A Magician!!" Welcome to the online magic store. Hi everyone! Thanks for dropping by the magic shop today. If you or someone you know is interested in learning magic, chances are you're going to find some great treasures here! My name is Mark H. Wurst, New Jersey's favorite family entertainer. Since 1984 I've been performing my unique brand of interactive comedy magic for corporate events, schools, libraries and private parties. 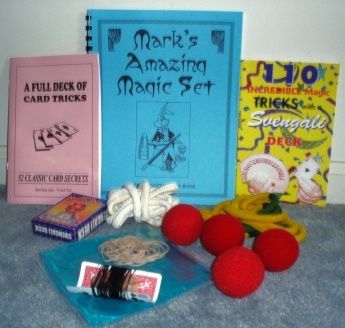 Over the years I have put together a number of signature magic products designed specifically to give children and/or adults a chance to learn some REAL magic and discover this wonderful art that I have been involved in since I was just a kid. Look around. Have fun, and always BE MAGICAL!! Every budding magician needs a magic wand to get started. The Magic Wand Kit isn’t JUST a wand. It comes with an insert that will teach the children how to perform a number of tricks with the wand. The wand is also a magic trick in itself and can perform an amazing balancing act with a little preparation. Kids go wild when they receive their very own magic wand and just about anyone can perform the tricks with a bit of practice. This is the coloring book that kids won't just toss aside. 2 books in 1 --- 1 part coloring book + 1 part magic book = 100% FUN! This is the largest magic coloring book that we have ever seen. 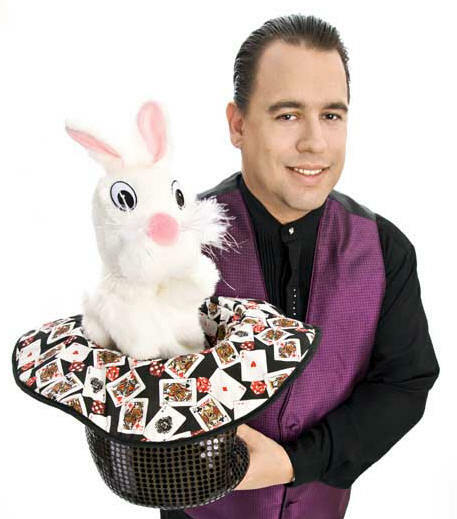 (Nearly 11"x13") Younger children will delight in coloring pictures of the magicians performing their illusions. 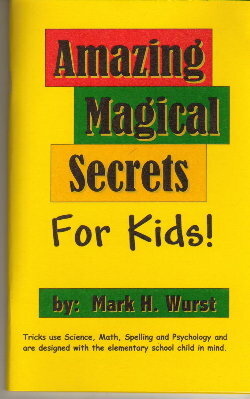 The second half of the book contains illustrations and easy to follow instructions on a number of cool magic tricks that children can perform with items found around the house. "Magic Tricks To Fool Your Friends"
"Magic Tricks To Fool Your Friends" is your step by step guide to WOW other people with your new skill of magic! The secrets found inside this book will amaze you. Have no fear, all the tricks are easy to learn and can be done with just a little bit of practice. After reading "Magic Tricks To Fool Your Friends" you will be the talk of all of your friends. You'll make their coins disappear and reappear in impossible places, you'll be able to read their minds, and best of all, levitate inches off the ground using no string, wires or fake shoes. Sound impossible? It's not! There are a ton of magic sets out there to get interested kids started in the world of magic. But none are as cool as this one! All of the props are stored inside the giant magic wand. (24”x3”) Set includes all the necessary props, illustrated instruction booklet and a BONUS magic wand booklet with various tricks to perform with a magic wand. Plus, step by step instructions on how to make your own magic wand. 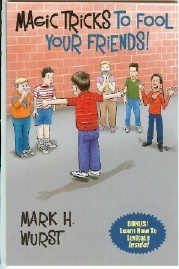 "Amazing Magic Tricks For Kids"
This is Mark’s 1st book of magic tricks. It is designed for younger children (Ages 5 and up) but everyone will have fun learning these mysteries. Over 50 tricks that use science, math, spelling & psychology and can all be performed with items found easily around the house. Fully illustrated – A perfect starter book. Lots of great things come in small containers. Don't let the packaging fool you. 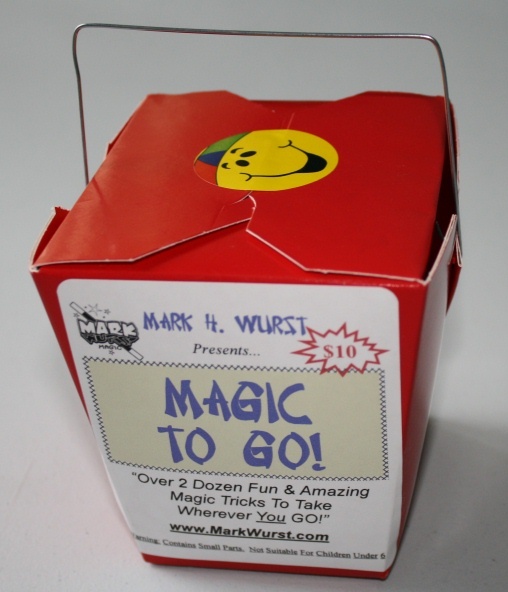 This 2-quart Chinese food container is actually filled with magic tricks, puzzles and everything you'll need to have everyone around the dinner table amazed by effects like the Jumping Rubber Bands, Linking Paper Clips, Ring & Spring Mystery, Two Card Monte, and much, much more! Professionally designed magic set for advanced magic students. No toy magic or plastic props. This set is the REAL DEAL! 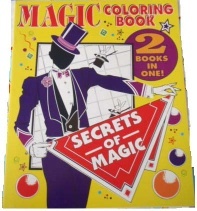 Includes fully illustrated instruction manual PLUS 2 bonus books of card tricks. Along with rope, sponge balls, silk handkerchief, special 'miracle gimmick' and a whole lot more, you'll be performing magic just like the pros before you know it. As an added BONUS, learn how to make a borrowed twenty dollar bill float in mid air. Adults, teens and older kids will love every minute of this set! click below to see my special birthday website.